We are back from our Memorial Day weekend away. We had a great time, did lots of fun stuff, but now it's time to "get busy!" I have less than two weeks til Farm Chicks and can you believe this? 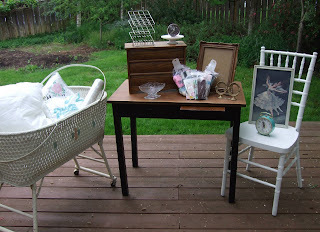 Isabel and I are doing a garage sale this weekend with some of our antique dealer friends. We cleaned out our booth and are getting rid of our junk that has been sitting around. I am also going to pull things out of the garage pile that I know I will never get around to fixing up. I am either ambitious or crazy, can't decide which one. The upside of doing the sale this weekend is that hopefully I will make some money to take with me to Spokane. Here is a picture of my thrifting finds from last week. I had a really good day. Hit my usual thrift stores. Most of these will go to FC with me. Click on picture for a close up. My favorite finds of the day were the desk, pink clock (I'm keeping it! ), little oak three drawer chest and the bassinet. The little metal rack on the top of the chest is perfect for holding test tubes which I am filling with vintage buttons. I got this idea from Joy. On Thursday I went to my good friend Debbie's house where she helped me with a project. 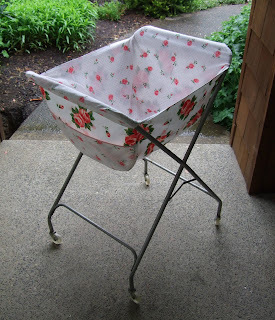 I had this laundry basket/cart for a long time. Got it at a garage sale ages ago. It had a nasty vinyl liner in it which we cut up to use for a pattern. I am super happy with the end result and I owe Debbie a huge thank you. She did 99.9% of the sewing on this project. She is a way better seamstress than I will ever be. So Deb, thanks so much! I still owe you lunch at PB. 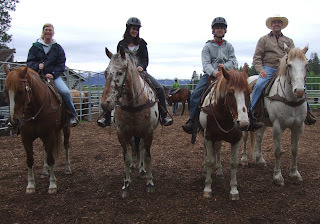 We headed over to central Oregon on Friday to spend the weekend with my honey's folks. It was a very busy and fun weekend. 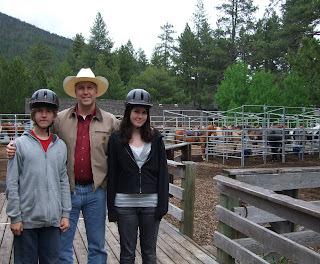 We played golf, visited an antique mall (only found a couple things), went to see the new Indiana Jones movie (fun and good), went to church, and on Monday morning we went over to Black Butte ranch for a little trail ride. 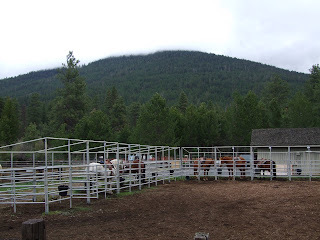 Here is the view from the stable office. Kind of a cloudy day, but at least it didn't rain. My favorite people in the whole wide world. Ready to ride. Here we are. Ready to go! Patricia at Vintage Linen Treasures was sweet enough to tag me to do the things about me thing. I have been tagged a few times for this and I always have a hard time coming up with interesting or weird things to tell. So, if you are newish to my blog and want to know more about me, you can read about it here. I am going to take a little blogging break for awhile, but will be back after Farm Chicks with lots of great pictures and hopefully some good stories for you. Until then I will leave you with a picture I just got from my Dad of his long waited for new toy. Too cute! What a cute car! Guys and there toys! (o: It sounds like you had a wonderful week-end. I hope you do real well at Farm Chicks! Hope to see you there! Hello and thank you for creating such a great blog to visit! I am drawn to much of what you have here! Definitely my kind of place. I love love love your shopping cart liners! I have been doing markets in the Chicago area for 6 years and always take some ole carts to sell. Seems people always wished they had something to carry things in by the time they get to where I'm sat up! haha I have talked MANY a time about finding someone who makes liners! How sweet! Why do you live so far away? haha If you don't mind, I'd love to add a link to your blog from mine. I'm just getting started but know that anyone who visits mine would love yours! Love your Dad's car, have a great time at Farm Chicks, can't wait to see the pics...thanks for stoppin' by the blog. Yay for Farm Chicks! when and where is the sale?? 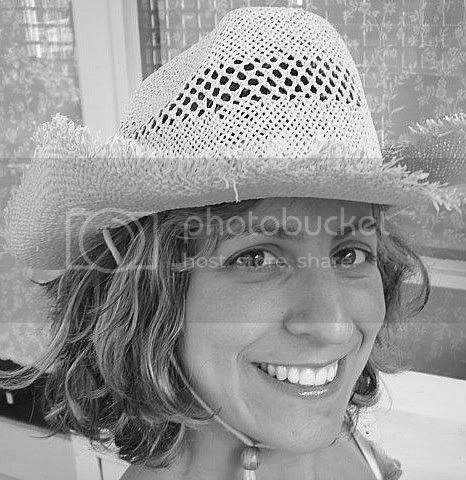 I wish you well at Farm chicks-what a cool undertaking! I'm not sure if I'll make it this year...life is calling! oh my gosh, that car is the cutest thing! Love your dad's new car!! Love those cute alarm clocks you found, too! Hey Lisa! We knew there was something missing from the Diane-Joy-Isabel equation at our event!! :o) We are so sad not to be going to Farm Chicks with y'all...hopefully next year we will have Barn House in a manageable state so we can travel to some fun shows like that. We wish you the best...we know it's going to be a very profitable blast!! Your buggys are just lovely with the linings you have made. I am really enjoying your blog and beautiful finds. You are one busy chickadee! 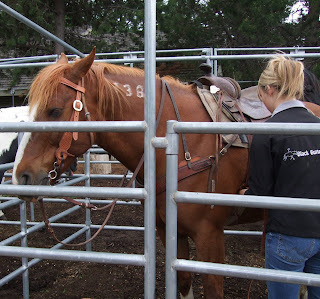 Love your horse, your dad's new toy (too cute!) and your sweet finds. Have fun at Farm Chicks and I know you will sell tons of stuff. I can't wait to come find you at the Farm Chicks Show! I might need that cute little shopping cart. Hope you have a wonderful time in Spokane and do well. Love the new toy your dad got! Good luck with Farm Chicks, be sure to take lots of pics of course! Loving your finds, I especially love the frames, they're so beautiful! LOVED LOVED LOVED meeting you this weekend! We were all still talking about how much fun you were on our way home yesterday. Hope you had a wonderful show. I also hope you have a massage and pedicure lined up for this week. YOU DESERVE IT! That was an INSANE SHOW! It was great meeting you at the Farm Chicks show this weekend with Miss Timi. Cute stuff! Hoping we can get down to see you in Portland. People were constantly stopping Timi to find out where she got her oh-so-cute shopping basket. Crazy show -can't wait to hit it again next year. Hope you are relaxing.